INCLUDED IN THE PRICE: $15 PRIORITY MAIL SHIPPING & PROCESSING. This 1 US Quart (32 oz., 946ml). 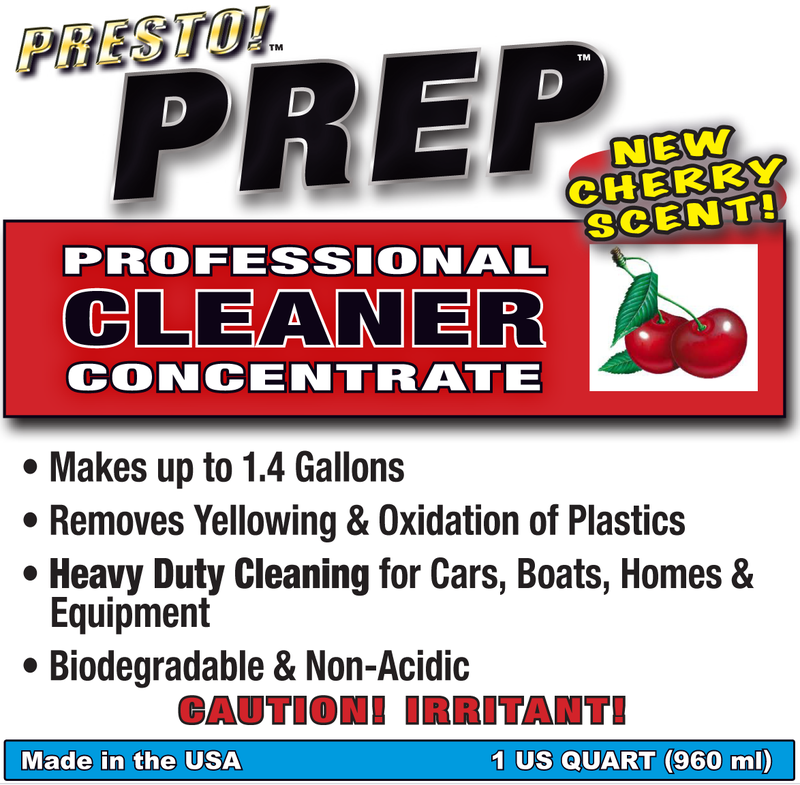 Bottle of PRESTO!™ PREP CONCENTRATE makes up to TWO AND A HALF GALLON US Gallons (9.5L), or sixteen 16 oz. bottles of cleaner costing $5 per 16 oz. bottle. PRESTO! PREP™ is the only product we know of that washes the yellow out of plastics such as car headlights - ON CONTACT - with NO risk of melting the plastic. To wash out the yellowing from headlights, use PREP™ at full strength, no not dilute it. You actually see the yellow start to wash out of the headlight on contact. For other uses, follow dilution directions. PREP™ eliminates all of the sanding normally needed to get the yellow out of headlights. This also eliminates the risk of sanding a hole in the headlight while you try to sand out the yellow. This is the secret to how we can recondition a headlight in less than 5 minutes. After you use PREP™ to get the yellow out, you then use PRESTO!™ PBR™ to permanently penetrate, seal and protect against further weather damage.